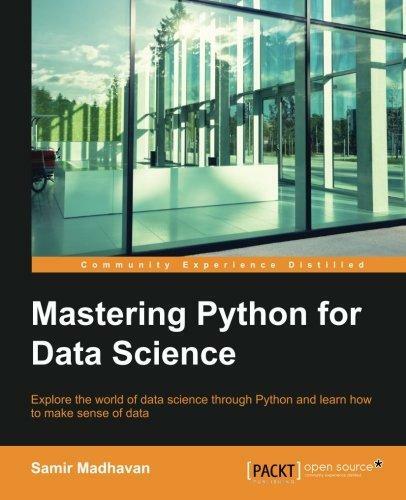 Explore the world of data science through Python and learn how to make sense of data About This Book * Master data science methods using Python and its libraries * Create data visualizations and mine for patterns * Advanced techniques for the four fundamentals of Data Science with Python - data mining, data analysis, data visualization, and machine learning Who This Book Is For If you are a Python developer who wants to master the world of data science then this book is for you. Some knowledge of data science is assumed. What You Will Learn * Manage data and perform linear algebra in Python * Derive inferences from the analysis by performing inferential statistics * Solve data science problems in Python * Create high-end visualizations using Python * Evaluate and apply the linear regression technique to estimate the relationships among variables. * Build recommendation engines with the various collaborative filtering algorithms * Apply the ensemble methods to improve your predictions * Work with big data technologies to handle data at scale In Detail Data science is a relatively new knowledge domain which is used by various organizations to make data driven decisions. Data scientists have to wear various hats to work with data and to derive value from it. The Python programming language, beyond having conquered the scientific community in the last decade, is now an indispensable tool for the data science practitioner and a must-know tool for every aspiring data scientist. Using Python will offer you a fast, reliable, cross-platform, and mature environment for data analysis, machine learning, and algorithmic problem solving. This comprehensive guide helps you move beyond the hype and transcend the theory by providing you with a hands-on, advanced study of data science. Beginning with the essentials of Python in data science, you will learn to manage data and perform linear algebra in Python. You will move on to deriving inferences from the analysis by performing inferential statistics, and mining data to reveal hidden patterns and trends. You will use the matplot library to create high-end visualizations in Python and uncover the fundamentals of machine learning. Next, you will apply the linear regression technique and also learn to apply the logistic regression technique to your applications, before creating recommendation engines with various collaborative filtering algorithms and improving your predictions by applying the ensemble methods. Finally, you will perform K-means clustering, along with an analysis of unstructured data with different text mining techniques and leveraging the power of Python in big data analytics. Style and approach This book is an easy-to-follow, comprehensive guide on data science using Python. The topics covered in the book can all be used in real world scenarios.